Several months ago I wrote an article to share my experience of a web developer moving to the world of mobile applications development. I am working in this field using the Xamarin technology. And you might have heard that Microsoft just acquired Xamarin, but I will not speak about this topic in this blog post, I do not have any opinion at the moment regarding this news. When I introduce myself as a Xamarin developer, I often have to explain what it means even to other developers. And this is why I am creating this blog post, to introduce not only the technology but also the entire platform. “Oh, I see, it’s like Cordova” is an answer I get from time to time, which is a start. Well, if you imply that Xamarin helps building cross-platform mobile applications, it is correct, but it is not really “like” Cordova. So, if the only difference is the programming language, what is the advantage of using Xamarin? Well, if you develop a mobile application on only one platform it might not be very interesting to use it except if you only know C#. But if you create an application on several platforms, it becomes relevant, because you can share code between Android, iOS and Windows Phone for instance. All of your apps use the same programming language. For example you can create a library with a API client for you application and use it on Android, iOS and Windows Phone: write it once and use it three times. It is also possible to use Xamarin.Forms to share code between the User Interface (UI) for the three platforms I previously mentioned. But I will not go into the details because I have not used this technology at the moment. I can only tell you that it used a similar XAML format than the one available on the Windows platform. “But how do I write C# with Xcode?” You cannot, to develop mobile applications with C#, Xamarin provides an Integrated Development Environment (IDE) called Xamarin Studio which is available on Mac OS and Windows. You can also use a Visual Studio plugin to create Android and iOS apps from Windows, but keep in mind that you will still need a Mac for iPhone/iPad to be able to build and for the simulator. Xamarin also provides their own Android simulator to test and debug android applications: the Xamarin Android Player, which is pretty good and available on Windows and Mac. You can also monitor your applications with the Xamarin Profiler (still in preview at the moment) in order to track the memory allocations and to find potential memory leaks. It also allows to track time and to find bottlenecks. I used it to review the memory usage of an existing application and I was able to detect several anomalies easily, it is a very helpful tool. Xamarin not only provide tools to help us developing cross-platform applications, it also offers several services to improve the overall experience. Learning mobile apps development can be overwhelming at first, especially when you try to learn several platforms at the same time. The Xamarin University aims to help you in this matter, but it clearly targets organization and not individuals (it is expensive). Xamarin also offers a cloud platform in order to test your applications on a lot of different devices: Xamarin Test Cloud. You can access more smartphones configurations than you will ever be able to get, you will be able to detect issues related to a specific OS version. Once your applications is released you might want to monitor what is going on, is it stable? What are the errors my clients encountered? What the users do with the application? 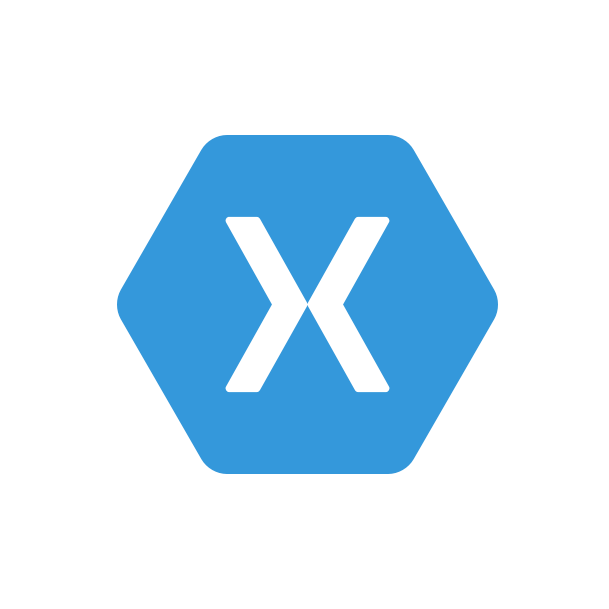 To answer these questions you can use the Xamarin Insights services. It will give you access to a dashboard allowing you to see a lot of useful information for your applications. But you will have to use the SDK and “plug it” inside your code base. So you have to plan it before your release if you want to use it, it is not something you just activate afterward. Here is my introduction of the Xamarin platforms, I hope this helps you to gain a better understanding of what is Xamarin and what are the tools and services available with it. Xamarin is not just a technology it is also an entire ecosystem available to the developers who want to create native applications. You also have to keep in mind that some of these products might change in the future depending on the strategy of Microsoft for the entire Xamarin platform. As a professional developer, my job is to created valuable software. And I think that one of the way to achieve this goal is by producing high quality code. It means that the coupling has to be low, the components clear and concise, the code coverage ration must be high and a lot of other things. At least this is how I defined quality when it is related to programming. Code quality is an abstract concept and can be interpreted in several ways. You can find “best practices” depending on your programming language and paradigm. As an Object Oriented Programmer working with C# I heavily rely on the “Clean Code” concepts and the SOLID principles (more here). Principles and concepts are mandatory for every professional developers. Yet when working on a huge code base it is difficult to know if your concepts are respected everywhere in your application. There are tools to help you with that and I had the chance to be able to test one of them, called NDepend and I will introduce it in this blog post. 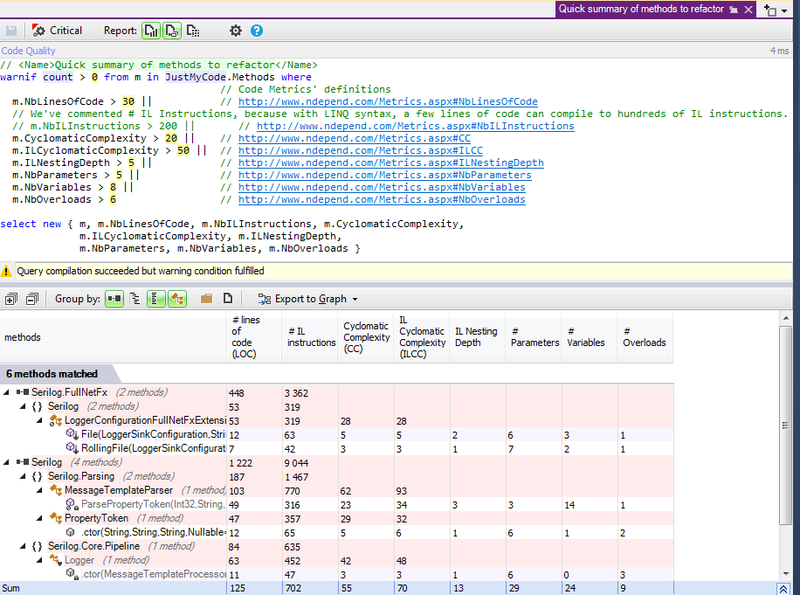 NDepend is Visual Studio extension that run static analysis on your .NET solutions in order to generate metrics related to your code to help you improve the general quality of your applications. It displays these metrics using lists, graphs, matrixes, tree maps and charts. And of course it is possible to customize all of it. I could try to describe every features available in this tool but instead I will just use an example to show you how it works and what it is possible to do with it. 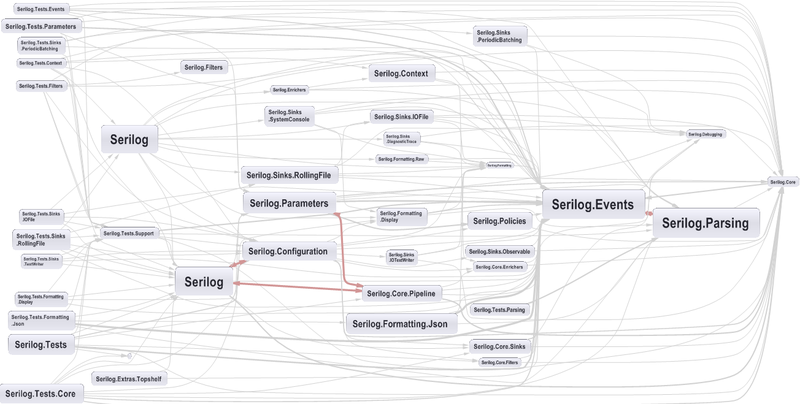 To do the demonstration I will use a .NET solution from an open source project on GitHub called Serilog. This project is a .NET logging library easy to use and extensible. Once I have installed NDepend and open the solution on Visual Studio I can attached a new NDepend project (.ndproj file) to the solution. 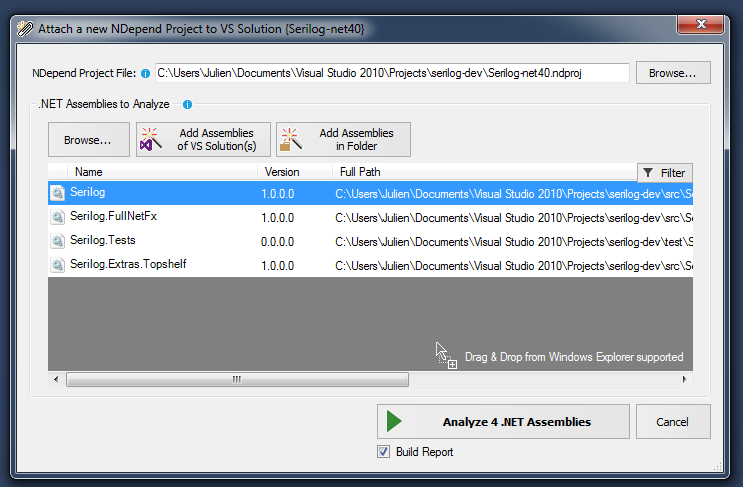 Everything is achievable from the NDepend menu inside Visual Studio, you don’t need to run third-party tools. From there I can choose the dynamic libraries (DLL) I want to analyze that exist in the solution. If I want I can exclude libraries I don’t want or that are not relevant. After this you can start the analyze right away and see the result of it after a few seconds (it is really fast). Once it is over you are able to display the dashboard which will give you an overall idea of your code quality with some metrics. On this dashboard you are able to see the total number of lines of code, the number of types, the average method complexity (1.67 is definitely good). There are a lot of charts that will allow to see the evolution of some metrics over time. And there is an area dedicated to “code rules”, for the moment you can consider this as a “warning” counts, I’ll come back to this later. Of course this dashboard is customizable if you want to get rid of some metrics to put others instead. Once your solution has been analyzed you can display a dependency graph at an assemblies level to have a quick look at the solution organization and to check where the external libraries are used. For example on this graph we can see that the test project uses NUnit as testing framework and not the default one provided by Visual Studio. There are not much external dependencies. It is also possible to generate dependency graphs at a namespace level to get a more detailed view of the solution. For the following graph I only selected namespace from the solution and not from the external libraries. Do not worry if you think that this graph is unreadable, you can have coloration when putting your mouse over a node and you can choose to display only a portion of the graph. You can also see that there are some red edges on the graph, it means that some namespace are mutually dependent (they use each other) and therefore are highly coupled. Maybe you allow that, maybe you don’t, but this is a first indication that quality can be improved in this area. NDepend comes in with a huge set of code rules that aim to pinpoint the types or methods in your application that can be improved following some “best practices”. Here are the rule categories available. On the left panel you can see all the rules related to the “code quality” group. 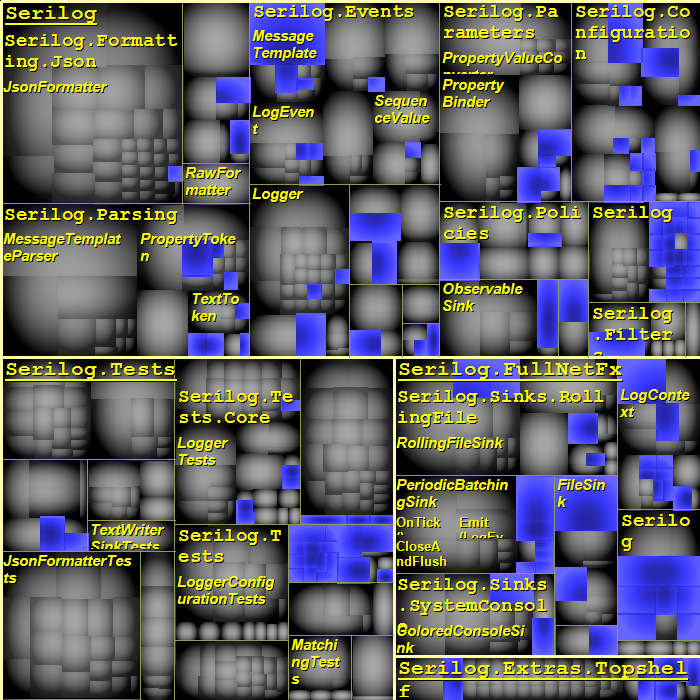 The analyze have found that 2 methods might be too big and 6 methods might need some refactoring. By clicking on a rule it opens a new window giving you the details for this rule and the result. This is where the real fun starts! The rules are “open-source”, they are written in a LINQ-like syntax (called CQLinq) and you can edit them at your convenience to match your needs. And of course the result in the lower panel is updated in real-time. For me this is the big feature of NDepend, you can request your code with an user-friendly API allowing you to check a huge amount of details. You can really customize the rules the way you want to match your quality requirements. The way I enjoyed the most working with NDepend is when I bind the queries editor with the tree map view. This way I can locate in the blink of an eye the parts of my project that match my query. 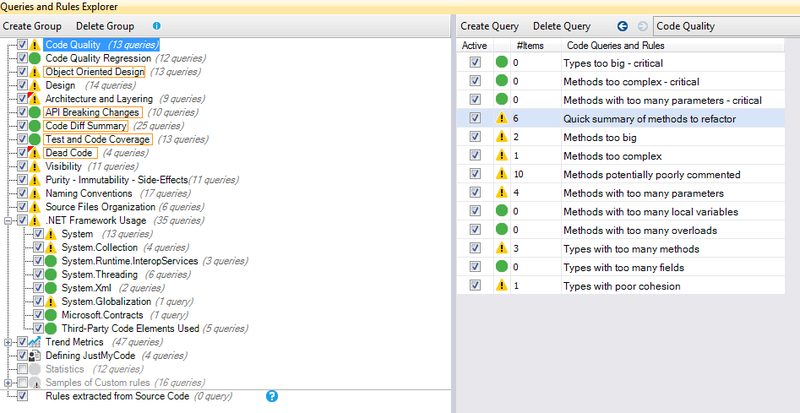 And then I am able to see the components of my applications that match several queries. This can be a powerful indicator to track down the lack of quality. For example I will display all the methods that can have a lower visibility (it is a NDepend base rule in the “visibility” group). // This rule tells which methods can be declared with a lower visibility. // (like 'private' is a visibility lower than 'internal' which is lower than 'public'). // and with it maintainability and extensibility. // If you don't want to link NDepend.API.dll, you can use your own attributes and adapt this rule. // Eliminate default constructor from the result. // in the current rule. // Don't decrease the visibility of Main() methods. And the tree map view is now updated. We can see that there is a lot less “blue” in the test area but some is remaining. And these maybe are some refactoring opportunities we would have missed if the complete DLL had been excluded. 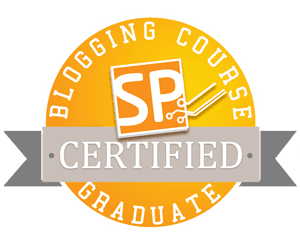 In this blog post, I only scratch the surface. 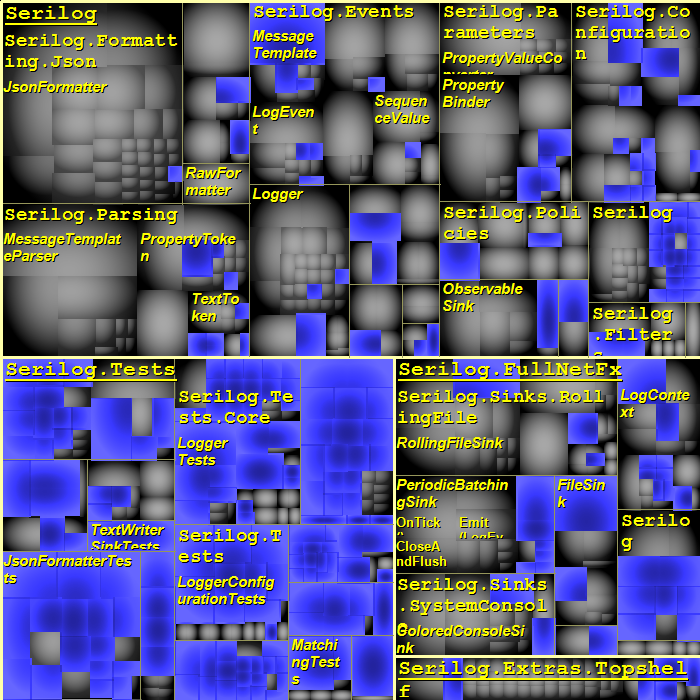 NDepend provides a lot more functionalities to improve your .NET code quality, you can find some of them in a presentation I made a few weeks ago (available here). As a professional developer focused on software quality, NDepend is a great tool. I personally love all the visualization and the customization it provides, it is refreshing. I can create and/or reuse all the rules I want to match the level of quality I desire. And I still have a lot to discover in the potential it offers. If you would like to know more or have some details on more specific parts of NDepend, let me know.